Whispers from Wildwood: Let's hear it for the girls! 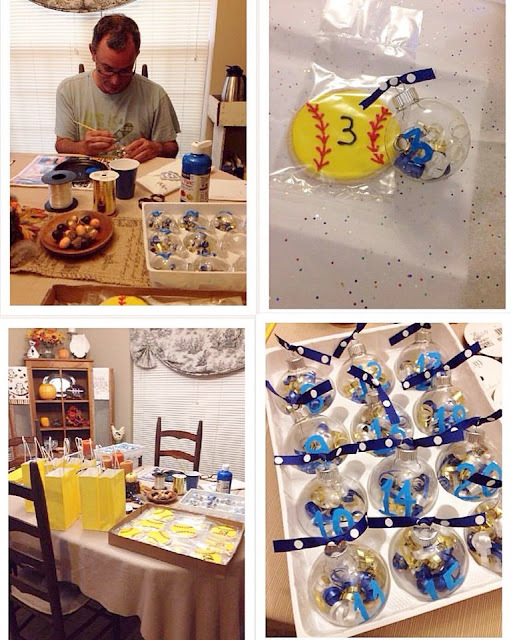 The week before Thanksgiving, I had some help from the Mister and a friend to do a little project to bless the girls on our high school softball team for another great season. I told y'all all about their trip to the state playoffs again this year. Well, I just wanted to show them my appreciation for a job well done and how proud we are of them. They represented our school so well with their good sportsmanship and great attitude. I knew I wanted to give them each a cookie decorated like a softball with their jersey number on it. A friend of mine baked them for me and so the hard part was done. But I didn't want to give them just that. Well, after some Pinterest inspiration, I decided to make these cute little ornaments with our school colors. I cut strips of blue, white, and gold ribbon and curled it. After that, I slid them down into the ornament, put the cap back on and tied a blue and white ribbon. Scott painted the numbers on there for me and we delivered them one morning to the school. It's a quick and easy project and it was alot of fun surprising them with something unexpected.